Birds once and still do play an important role in American Indian culture. Birds provided a source of food as well as a way to make tools from beaks and bones. 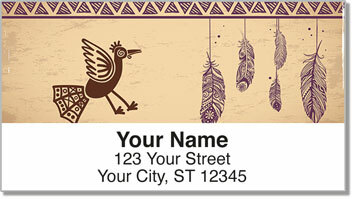 But more importantly, birds were involved in many tribal ceremonies. 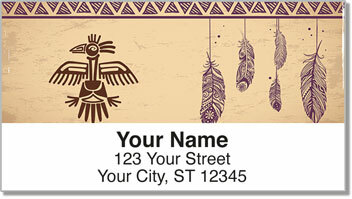 Feathers - especially those of the eagle - are considered sacred. Their are many myths and legends that tell of birds as spiritual messengers. 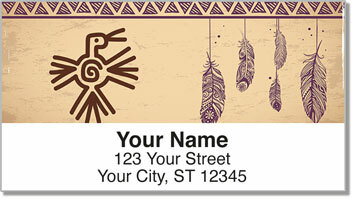 These eye-catching symbols were inspired by the artwork of different American Indian tribes. They give you a unique way to top off every letter or package you stick in the mailbox. Plus, a self-adhesive backing makes them extra easy to use. Just peel and place on each envelope. 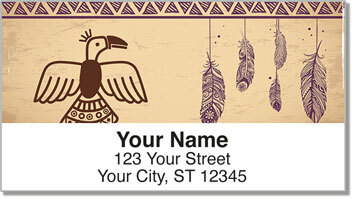 Get your own Native American Bird Symbol Address Labels now! Order them with matching checks and get free shipping.